Tasty and healthy chettinad delicacy suitable for all occasions; made of an unique rice variety rich in antioxidants. Wash and soak the rice in 4 cups of water for about 3 to 4 hours. Pressure cook rice with water; after the first whistle simmer for 15 to 20 minutes and switch off the gas. Now give a quick mash using a ladle. Add grated coconut, sugar, ghee while the rice is hot and mix well. Roast the cashews with ghee in a separate pan. Add cashew nuts to the rice mixture and mix well. Your healthy and tasty rice is now ready to serve! I have never heard of this version of pongal. My mom makes puttu with black rice. wow..a healthy preparation!! love it!! 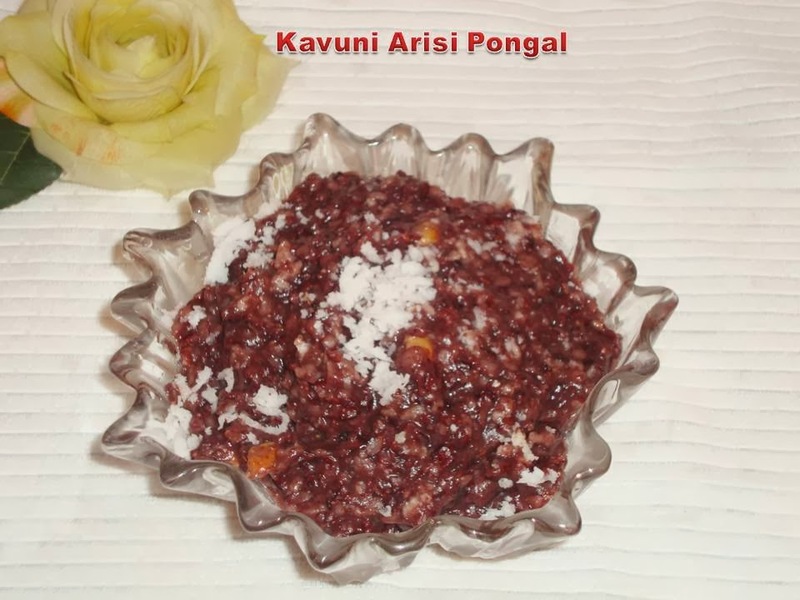 Healthy and yummy Pongal ! Wat an authentic food, missing this kavuni arusi here. recently tasted this dish in our friends house....really excellent...searching for the black rice in CBE!!!! !